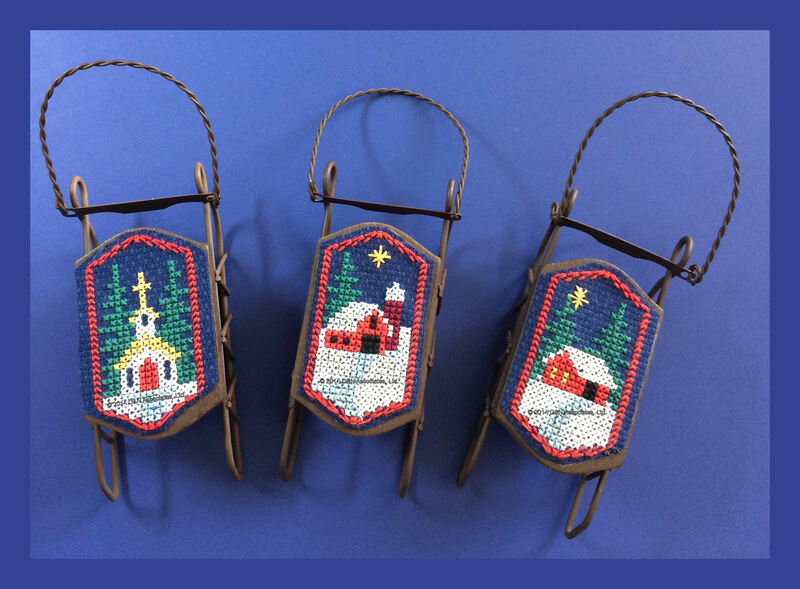 These are a Foxwood Crossings design called Snow Country Sleds. I worked this on a 14 Count Navy Aida Fabric then adhered (using double side tape) onto the wooden/metal sleds. Design suggested to work on perforated paper but I prefer fabric. The design, fabric and sleds were purchased from 123Stitch.com. Each of the three designs is 17 x 31 count. Design has color charts for Sullivans or DMC stranded floss, using three strands. I found the three strands to look too bulky and went to using two strands and a laying tool. For the white, red and black threads I used single strands of DMC Coton a Broder size 25. The green thread for the pine trees is a Danish Flower. The DMC coton a Broder and the Danish Flower threads were purchased for another project from hedgehoghandworks.com. All other thread used was DMC stranded floss. The instructions called to use a dark blue thread for the nightime sky but instead I choose to use dark blue fabric. This (lack of stitching the night time sky) placed the sky (fabric as background) giving a dimensional look. I also experimented with the different width of blue fabric I left as I trimmed. In the photo I like the middle sled where I trimmed the blue fabric close to red stitched edge. 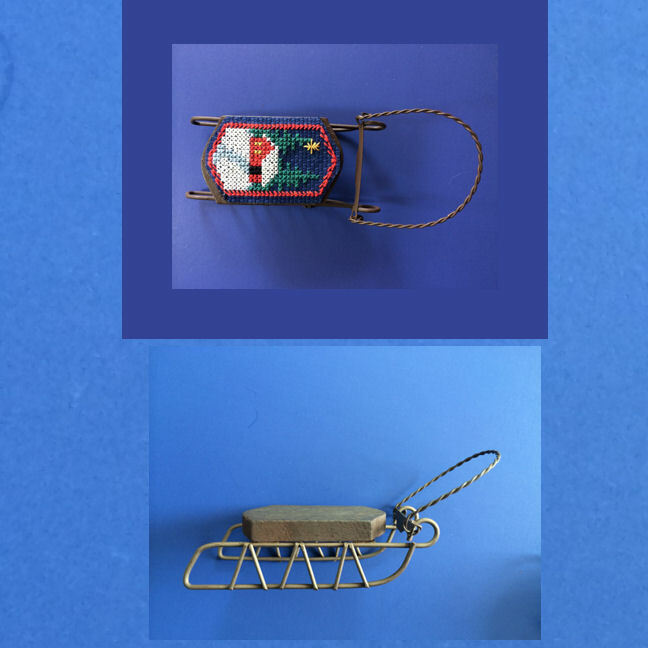 The wood/metal sleds from Foxwood Crossings are approximately 5 1/2 inch long by 2 inch wide. They offer other designs that will fit the top part of the sled and also a slightly larger sled. The sleds I purchased came in a pack of three. There are two screws which attached the wood sled piece to the metal sled body. I had considered taking the wood sled piece off, spray painting it Christmas red or dark blue to match the Aida fabric but decided to leave it painted brown. 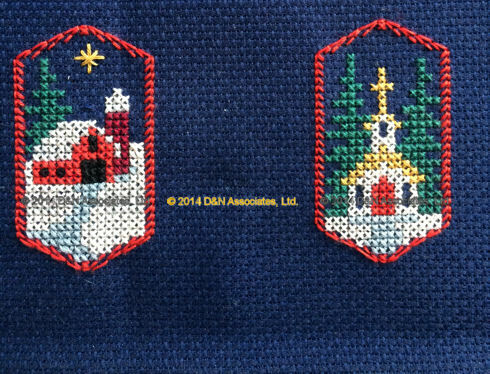 The design called to edge in cross stitch, I decided to do half cross stitch edge in red thread finished with a running back stitch.